For this trip I have used a Nikon D600 with a Tamron SP 24-70 F2.8 VC USD packed up in my Sony Alpha shoulder bag. Sadly my D600 had the dust/oil spot issue wherefore editing the pictures took a lot of time. But I made it through and I am pleased with the results (although I shot only in jpg with Vivid picture mode). Some pictures are similar to the pictures in this blogpost where I also visited the Salzburger Altstadt and the Fortress Hohensalzburg. After arriving around 8 o’clock in the morning we drove to the University from where I started my walk. I headed straight to the river Salzach. I followed the path alongside the river towards the Salzburger Altstadt with the Residenzplatz and the Salzburger Dom. Heading up the Mönchsberg led me to the Fortress Hohensalzburg where I took the guided sightseeing tour. This is the only way to reach the top of one of the fortress towers which provides a gorgeous view. Then it was time to go back to University where I met my girlfriend for lunch. In the afternoon I decided to take a walk to Schloss Hellbrunn. It was a walk of about 4 km from the University to the entrance of the Schlosspark Hellbrunn. On the way I came along a beautiful, very long and exactly straight alley with big trees on each side. I also had a nice view at the mountains (and some building cranes). Arriving at the castle I headed directly through the park on a hill with a very nice viewpoint. As I walked around 15 km at around 35°C, I took a rest at the viewpoint and enjoyed the view before going back to University. Also my third photo tour was really great but with a drawback regarding the gear! About the photo tour itself: The gorgeous weather, the beautiful sights and plenty of time for taking pictures made up a very good day. Also the Burger at Raschofer’s Rossbräu I had for lunch was delicious :-). 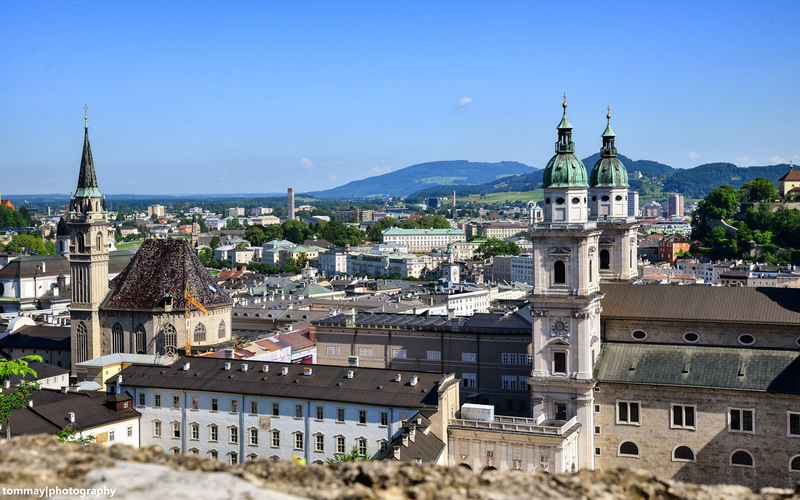 I can only say the same as in my other two recent reports: visit Salzburg yourself, you will not regret it! About the gear: The Nikon D600 dust/oil issue got really critical that day. Before this trip there were only a view visible spots but in Salzburg it got worse. I could literally see the increase of the spots from photo to photo. It was the first time I had so much spots on the pictures that I got really annoyed when watching the results at home. Editing was a real pain. The other thing I can say about the camera: The usability is very good, the ergonomics is decent but way behind the new design of the D750 with the deeper grip. You can find most of the functions as a direct button. As I shot only jpg with vivid picture profile the camera delivered very sharp pictures with vibrant colors in combination with the Tamron SP 24-70 F2.8. I recommend to read my review of the lens for more details of its quality. However, the spots ruined it a bit and after this trip I sent my cam to Nikon for repair (I got it back after about one and a half month but only cleaned.. no shutter replacement). But enough of the negative words here. I hope you enjoyed the pictures of my Salzburg series and I hope I could motivate some of you to visit the city yourself! Next post: Nikkor 24-70 F2.8G ED – Very good old standard zoom lens – without stabilization..